Tour de Write: Put on Your Walking Shoes and Get Ready to Write! 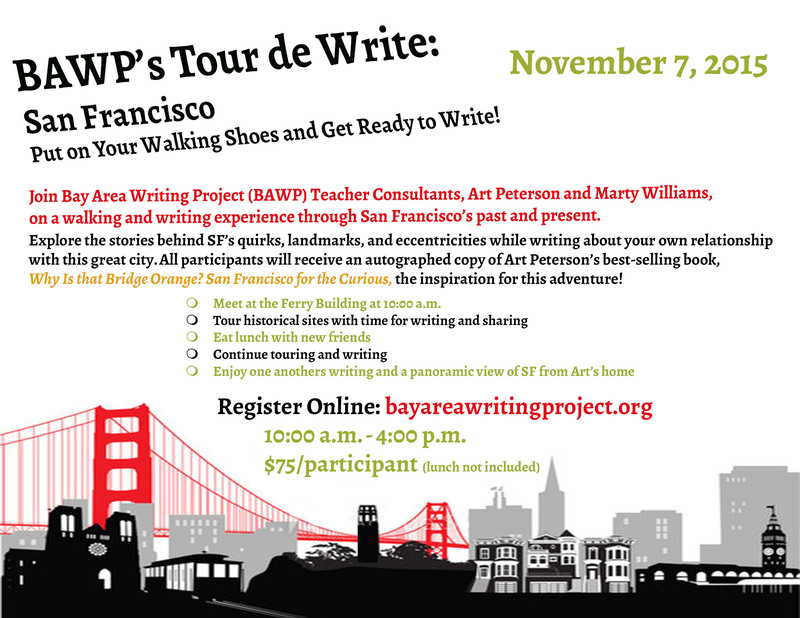 On November 7, 2015, join Bay Area Writing Project Teacher Consultants Art Peterson and Marty Williams as they lead you on Tour de Write, a walking and writing experience through San Francisco’s history and present. Come explore the past and present of San Francisco, write and share about your own relationship with this great city. We will draw on readings from Art’s best selling book Why Is that Bridge Orange? San Francisco for the Curious that explores the stories behind San Francisco’s quirks, landmarks and eccentricities. Participants will receive an autographed copy of the book. We will meet in the Ferry Building on The Embarcadero at 10:00 a.m., walk to a number of historical spots, hear a bit at each stop from Art about the history, write and share in small groups. We will find a spot for lunch along the way, continue our tour and end the day by 4:00 with a group read around in Art’s lovely home in San Francisco (with beautiful views!). By tarakaiser in Events on October 1, 2015 .